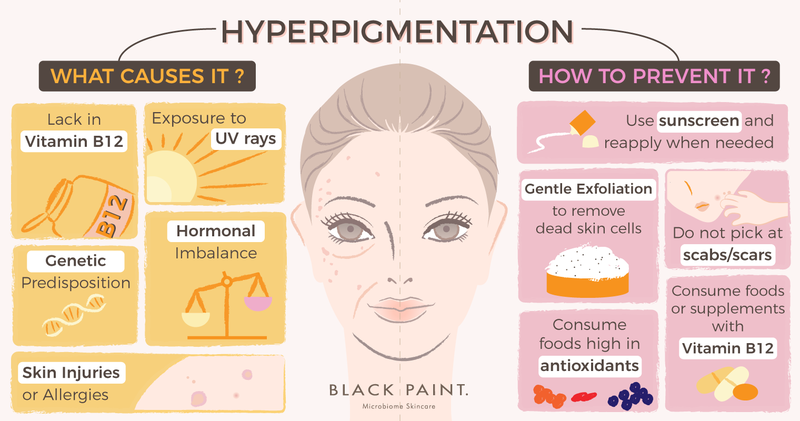 Hyperpigmentation is a common, usually harmless condition in which patches of skin become darker in color than the normal surrounding skin. This darkening occurs when an excess of melanin, the brown pigment that produces normal skin color, forms deposits in the skin. We often refer to hyperpigmentation as age spots, liver spots, freckles, sun spots, pregnancy mask. The condition is most often seen on the face, arms, and hands. UV-induced hyperpigmentation is a result of UV exposure and can be caused by the sun, tanning beds, fluorescent and ambient lighting. UV-induced hyperpigmentation appears as diffused spots that are evenly distributed around the face and is also referred to as actinic hyperpigmentation. Hormone-induced hyperpigmentation is often referred to as Melasma and is caused by hormone fluctuations from pregnancy, oral contraceptives, thyroid dysfunction, menopause or hormone replacement therapy. Hormone-induced hyperpigmentation will worsen with UV exposure. This types of hyperpigmentation typically appears in large symmetrical patched with jagged borders that form around the jawline, upper lip, cheeks and forehead. Read more about Melasma and how to treat the condition. Post-inflammatory hyperpigmentation is a result of skin irritation, skin injury, inflammation or abrasion. This form of hyperpigmentation appears as a darkened area left behind at the site of trauma or irritation and is common is people with acne, dermatitis, psoriasis and eczema – some people (depending on their skin type) may also present with this type of hyperpigmentation after receiving bug bites! Because the condition is primarily caused by inflammation or irritation of some sort (other than hormone-induced hyperpigmentation), treatments to exfoliate the skin need to be gentle. Aggressive methods of treatment such as hih-percentage acid peels, harsh scrubs or loofahs will all worsen the condition. It requires patience and knowledge of how the condition is triggered to treat and avoid hyperpigmentation. For those with hyperpigmentation – the daily use of sunscreen cannot be overstated. Daily use of broad spectrum sun screen with SPF 30 or more, all year long, is critical for all people who have hyperpigmentation – especially those with UV-induced hyperpigmentation. Read more about broad spectrum sunscreen and how to Boost the Efficacy of Sunscreen. For more detailed information about hyperpigmentation, read 5 Questions About Hyperpigmentatation, Answered.